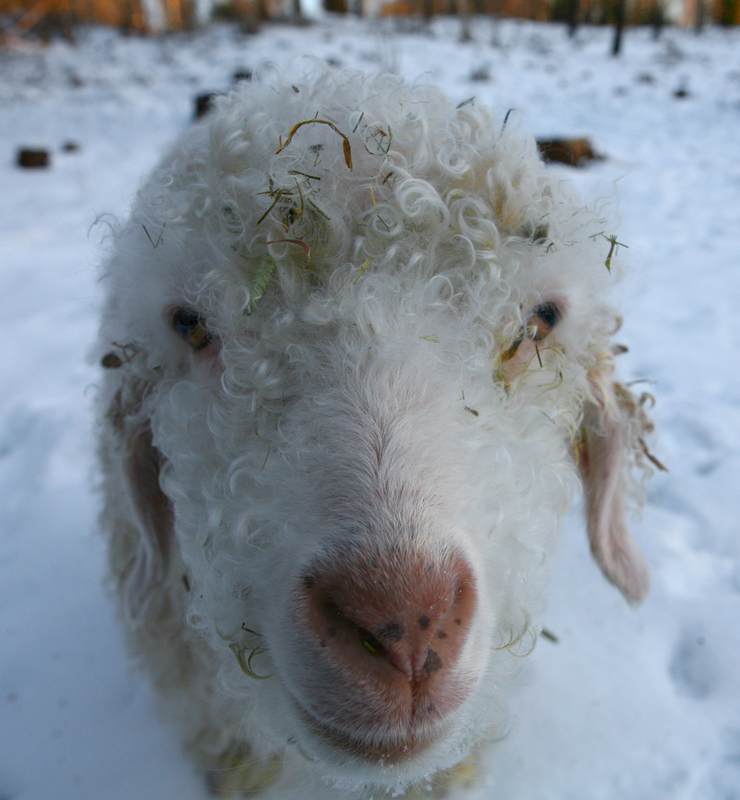 It’s really too cold for the goats to be outside very much, at the moment. Do these photos show where the word “goatee” – as in the beard – comes from? What are the little black pellets lying on the white snow behind the first goat (Misty?)? Holly. They’re probably raisins or coffee beans. I’m not sure where the word goatee comes from, nor why the style became so popular recently. The goats are back inside. They do like to get out every day, if possible, especially Vesla. Raisins or coffee beans? That’s what the goats eat? They are very special goats. No, they’re eaten by people. I think Crown is simply revealing the true origin of raisins and coffee beans. There are people who refuse to eat raisins. I wonder if many of them had a traumatic experience at a goat farm when they were young. Some people won’t even eat tomatoes. But I think you can’t blame that on the goats. I once tasted goat colostrum, out of curiosity. It didn’t put me off raisins. In the 80s, during the winter, I visited two friends of mine who had a goat-breeding setup near St. Louis. At the time, it was all the rage among intelligent, drug-crazed hippies to breed exotic goats. (Since then, I have discovered that goat-breeding was one of the cool things recommended in the Whole Earth Catalog). Anyway, these friends of mine had to get up in the middle of the night to milk the colustrum, every time a kid was about to be born. This happened while I was there, and I got up also so as not to miss the spectacle. The colustrum was in a glass, and looked yellowy and thick, like eggnog. Tim and Howard thought it was disgusting of me to taste it, but I couldn’t see what the problem was. It wasn’t bad, but it wasn’t something you would want to drink all the time. Perhaps I should have added nutmeg and a little rum. Our vet said it’s like starting a car for the first time. Leaving the colustrum for the kid would be like filling a new car up with petrol without putting any oil in: it would go for the first couple of minutes and then it wouldn’t. What, in your extended metaphor, corresponds in the goats to the oil? If colustrum stops individual kids in their tracks, how can goat species have survived ? Is this some kind of “natural birth pro and contra” issue, more ideological than physiological ? I mention “natural birth” because I just read Kramer versus Kramer (as a Spanish paperback I found on a doorstep near my apartment). I had never even seen the film. What a good come-uppance for feminists ! And yet, at the end of the book, I found I could not condemn Joanna. Did I mention that it is a very moving, gut-wrenching story ? I’m quite sure the vet wasn’t spreading ideological claptrap, this was a medical opinion. I haven’t read it in Spanish. I have always liked Dustin Hoffman’s demonstration of how to make French toast, in the film. In fact, I use his recipe to this day. The film is very good; she’s such a good actress that her portrayal made me hate Meryl Streep for years. It’s strange… For new born human babies colostrum is essential. If you want to see the film but don’t own a television you can stick the dvd in the side of your computer. But I expect you know that already. ” ideological claptrap [versus] medical opinion”: the distinction isn’t always sharp. I dare say vets are more resistant to IC than medics, though. At least in Britain, it’s harder to get into Vet. It is here too. Supply & demand. Apparently the work’s easier if you can get in, or so I heard. I should really see if what I’ve written about colostrum is right. I’m no expert. I was once given something to drink by my host family in Jordan, I never found out what it was. Like very thick milk, not unpleasant but it was warm, which for some reason creeped me out. They acted like it was quite special. They did have goats on the premises, I think they belonged to the grandmother. You couldn’t walk through the compound without running into goats from one family or another. On the other hand, camel’s milk I like. You mix it half and half with hot sweetened tea. I’ve seen half & half in American supermarkets. So that’s what it is. Interesting. A “half and half” is a half pint of beer served with a double whisky: everyone knows that. In Cologne,halb-und-halb in the meat section of a supermarket is ground pork and beef in equal quantities. Otherwise, halb-und-halb is a kind of potato dumpling made with equal amounts of mashed potatoes and raw grated potatoes. You mix them together and then simmer them in water. Is the potato one any good, Stu? Germans are wild about them, considering them to be the pineapple of potato perfection. When I’ve had them, I found that the raw part tasted raw. That may have been a deficiency on the part of the cook rather than of the recipe. The Schwaben make a disgusting thing called Maultaschen, which are a kind of large flat ravioli that are always undercooked, and apparently are supposed to be that way. They become edible only after you bung them into a pan and fry the bejesus out of them. Råmelkspudding “colostrum pudding” is a traditional Norwegian dessert. Very, very good. Råmjølk har ei mildt lakserande effekt som hjelper ungen med å få ut mekonium. But meconium is “is the earliest stools of an infant”. So what is that Norwegian sentence saying ? Colostrum has a mildly laxating effect that helps the child to excrete meconium. If that doesn’t work one should have the system audited by a meconical engineer. Must be the reason why there are still only 4 1/2 million Norwegians. I guess Crown and the vet are just colostrophobic. The stuff sounds perfect in all respects – pudding for old folks, laxative, immunostimulant and antibiotic for young folks. And a topic of general interest for the middle-aged, like rectangular pupils. They’re probably undernourished. 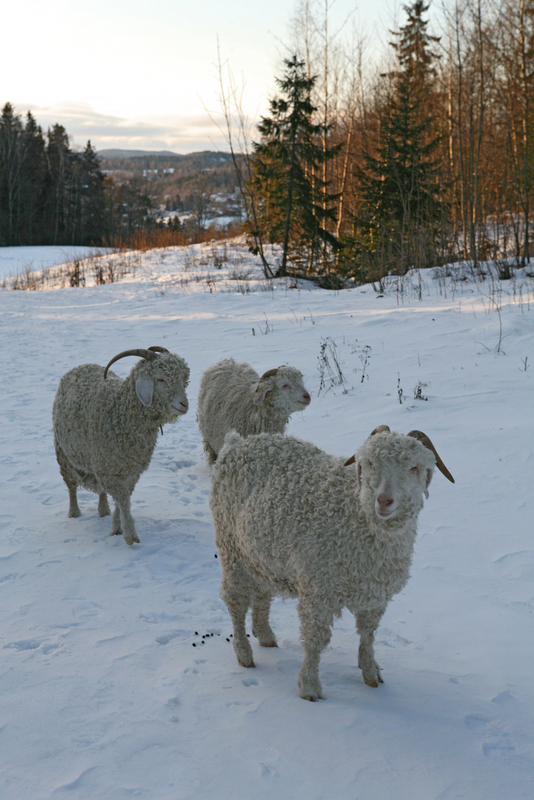 Step up the goat-to-Norwegian ratio, introduce free pudding for all, and watch the population grow ! Unlike my contemporaries, I am not middle-aged. Don’t rub it in. We know. We’ve seen photos. Or maybe they have all been drawings.